Nothing brings people together like food, the dinner table is where stories are shared, memories are made, and comfort given. It doesn’t matter if you’re serving pizza, pasta, or filet mignon, it’s all about spending time at the table with the people who color your life. And no other food warms you inside and out like a big pot of chicken. Salt and pepper eight chicken thighs, skin on, bone in, then brown in a large frying pan over high heat. For best results do it in two batches so you don’t crowd the pan then set aside. 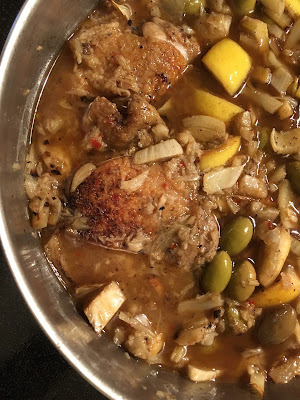 Turn the heat to medium and sauté a chopped head of fennel, two lemons cut into small pieces, a quarter teaspoon of red pepper flakes, and a pint of flavorful green olives for approximately five minutes then set aside. Next, brown 10 peeled garlic cloves for five minutes before adding two cups of chicken stock, simmer lightly until the garlic is soft enough to mash with a fork or potato masher. Layer the chicken and fennel mixture in a large soup pot, add the garlic stock and lightly simmer uncovered for 30 to 40 minutes. Salt and pepper to taste and share the warmth.